A N. E. Province Of Italy, in the W. part of Venetia, bordering on Tyrol and the provinces of Vicenza, Padua, Rovigo, Mantua, and Brescia, from which it is separated by the Mincio and the lake of Garda; area, 1,061 sq. m.; pop. in 1872, 367,437. The Adige flows through the centre of the province, and there are altogether 9 navigable rivers and 13 canals, and many streams and torrents. The N. part is mountainous; the other parts are level or undulating. There are marshes in the south, but the soil is generally fertile, and the pastures rich. The productions include grain, rice, fruit, flax, silk, oil, and wine, and several minerals. Lake Garda and the rivers are well stocked with fish, and game is plentiful. The principal mineral springs are at Caldiero. The chief towns, besides the capital, are Legnago, Villafranca, and Caprino. A City, capital of the province, at the foot of the last spurs of the Tyrolese Alps, on both sides of the Adige, surrounded by groves and villas, in one of the finest regions of N. Italy, 62 m. W. of Venice; pop. in 1872, 67,080. The Adige is crossed by many bridges, the finest and most recent connecting with the railway station, and floating mills are moored in the river. The fortifications were begun by the emperor Gallienus and continued by Theodoric and Charlemagne. The Scala dynasty erected forked battlements and towers, and the Venetians originated the outworks. Sammicheli introduced in the 16th century the triangular and pentangular bastions, and his plans made the whole system of fortification a marvel of modern engineering. His ramparts and bastions were almost entirely destroyed under the treaty of Luneville (1801), but the Austrians subsequently made it a formidable stronghold. Sammicheli's celebrated gates, the Porta Nuova and Porta del Palio or Stuppa, still remain, as well as vestiges of the Roman and subsequent walls. The principal square is the piazza dei Signori, with the palazzo del Consiglio, the colossal statue of Dante erected May 14, 1865, the Scala palaces occupied by the local authorities, and a campanile consisting of one magnificent piece of brickwork, 300 ft. high. The piazza delle Erbe, or vegetable market, was the forum of the republican era of the city. Besides the Corso, there are several fine avenues, but most of the streets are unsightly. Conspicuous among 48 churches is the cathedral of Sta. Maria Matricolare, mostly rebuilt in the 12th century, with exceedingly rich chapels and monuments and with Titian's "Assumption." Attached to the cloister is the Capitolare library, with important collections of historical, theological, and legal works and manuscripts. Sant' Anastasia is one of the finest Gothic churches in the whole country, though the front is not finished. San Zenone is the most characteristic specimen of media3val ecclesiastical architecture; it has a rich interior of singular grandeur, and the belfry of brick and marble, with arches and turrets, is one of the most remarkablo of its kind. San Fermo, called maggiore from its size, dates from the 8th century, and has remarkable monuments. The interior of San Giorgio Maggiore was embellished by Sammicheli, and contains paintings by Paul Veronese and other masters. Close to Sta, Maria Antica are the tombs of the Scala family. Verona is emphatically a city of palaces; several, such as the Canossa, Pompei, and Maffei (now Tresa) palaces, are among Sammicheli's masterpieces. The palace of the resident bishop (vescovado) was principally restored in the 14th century. Castel Vecchio and the adjoining bridge were built by Cangrande II. The picture gallery has been removed from the Consiglio to the Pompei alia Victoria palace in the via di Porto at the Campo Marzio, facing the Adige; it contains large collections, chiefly paintings by Veronese masters. The most imposing Roman antiquity in Verona is the ruined amphitheatre, contemporary with the Colosseum of Rome, built of marble, originally 513 ft. long, 410 ft. broad, with a length of arena of 248½ ft., and 100 ft. high, and accommodating 22,000 spectators. Part of it is intact; the interior is used as a circus, and the arcades for shops. Among numerous other Roman relics are fragments of a theatre and the Porta de' Borsari and Arco de' Leoni. Verona has associations with Dante, Petrarch, and Shakespeare's "Romeo and Juliet." The tomb of Juliet has long been destroyed, though one is still shown for the gratification of tourists. The city has a lyceum, a gymnasium, a theological seminary, a technical institute, an academy of painting and sculpture, a city library, an agricultural academy, a society for bee culture, and a private institution for indigent girls, who excel in silk and gold embroideries and artificial flowers. Among the many art collections, the Maffei is rich in inscriptions, statues, and vases. Silk, woollen, linen, and other goods are made. There is an active trade in these, and in grain, oil, and sumach, which has much increased since the opening in 1867 of the Brenner railway, which makes Verona the centre of mercantile communication with Germany, as it formerly was of military movements in N. E. Italy. - Verona was originally an important town in Gallia Transpadana, and it became a flourishing Roman colony with the surname of Augusta. In A. D. 812 it was conquered by Constantine the Great in his march from Gaul, and in 489, on the defeat of Odoacer, it was taken by Theodoric the Great, who often held his court at Verona. Charlemagne captured it in 774, and it afterward became a free city. The Scala family obtained supreme power in 1260, and were overthrown in 1387 by Giovanni Galeazzo Visconti of Milan. Cangrande, Dante's friend, was the most celebrated ruler of the former house. (See Scala, and Cane I. della Scala.) In the beginning of the 15th century it was annexed to Venice. The French took Verona in 1796, and ceded it in 1797 to Austria, but again held it from 1805 to 1814, when it was recovered by Austria. The congress of Verona (October to December, 1822), over which Metternich presided with Gentz for his secretary, aimed at the termination of the disturbed condition of Spain and Turkey and of revolutionary agitation in Europe, and its principal result was the French intervention in Spain in the following year. 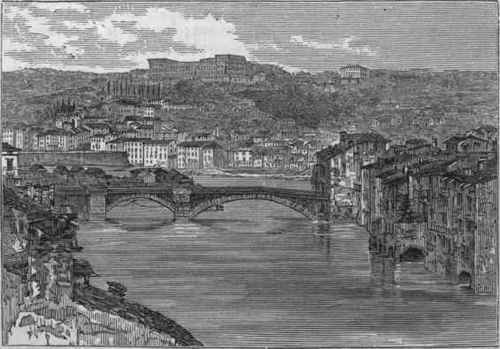 In 1866 Verona was incorporated with the kingdom of Italy. - See Maffei's Verona illustrata (Verona, 1731 - '2; new ed., 8 vols., 1792-3); Ronzani's Le antichitd de Verona (1833); and G. da Persico's Descrizione di Verona e della sua provincia (1838).